By joining our list, you're on your way to being qualified for the Monthly Sample Program. We will send you a Free Sample every month showing you new products and ideas to increase your bottom line. An informational email from time to time will arrive that describes our products & services to increase your sales. 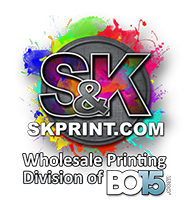 Thank You for Your Interest in Bo15, Inc.
Skprint.com is the Wholesale division of Bo15, Inc.
*A valid business license is required along with approval from your sales person to receive free samples. My member number for ASI, Sage, PPAI etc.. is:.